Florida's pleasant climate and warm waters offers refuge for several types of turtles. Some swim in the temperate ocean and gulf waters surrounding the state, while others live their lives on land. A few species bridge the gap by splitting their time between lakes or ponds and dry land. Several species of sea turtles call the waters off the Florida coast home, and the females come ashore when it's time to lay eggs. Loggerhead turtles are the most common Florida ocean inhabitants, with an estimated 68,000 nests on the coastlines each year. In smaller numbers, the green turtle comes ashore occasionally to munch on sea grasses and other vegetation. A few leatherback, Kemp's Ridley, and hawksbill sea turtles also nest along the Florida coast. Some terrestrial turtles serve vital functions in the Florida ecosystem. Gopher tortoises are stereotypical slow movers, eating vegetation near their burrows. They often dam up sections of their burrows to trap water instead of venturing far from their homes to search for water. The burrows provide homes for up to 250 species of animals, making the gopher tortoises essential to animals such as skunks, foxes and armadillos. 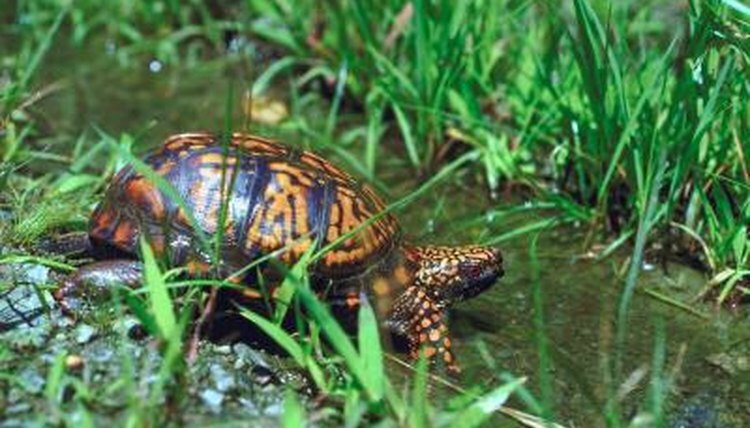 Box turtles also call Florida home, including the Florida box turtle and the Gulf Coast box turtle. Young box turtles eat mostly insects and small animals such as frogs, but adults stick more to a vegetation diet. Florida's interior offers many bodies of freshwater, which semi-aquatic turtles live in and around. Peninsula cooters, for example, live in ponds or marshes, often in large groups. They leave the water to bask in the sun together. Florida chicken turtles enjoy the same freshwater environments, but they also dig burrows to escape the heat when necessary. Other semi-aquatic turtle species include the Florida snapping turtle, the red-bellied turtle and the Florida softshell turtle. Among the many species of turtles living in Florida, several are considered endangered or threatened. All the sea turtle species, including the loggerhead, appear on Florida's threatened or endangered species lists. Most baby sea turtles -- about 1 in 1,000 to 1 in 10,000 -- survive to adulthood, and many that do are killed by predators or humans. Terrestrial and semi-aquatic turtles also appear on the lists, often threatened by habitat destruction, predation and capture or killing by people. These threatened and endangered turtles include the box turtles, gopher tortoises and Florida chicken turtles.